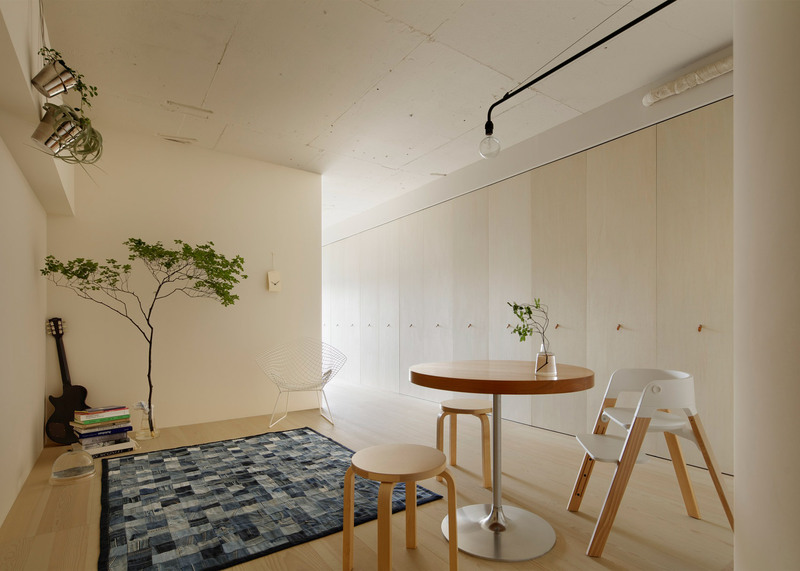 Design studio Minorpoet has overhauled a 1960s apartment in Tokyo to create a simple home and workplace that has its kitchen hidden behind folding wooden doors (+ slideshow). 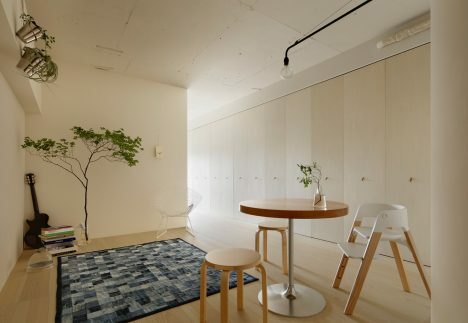 The Tokyo-based studio tried to incorporate various traditional Japanese design techniques with its renovation of Apartment in Kitasando. The folding doors that hide the kitchen counter and storage space were inspired by Japanese folding screens, known as Byōbu. When the screens are closed, the apartment has a minimalist aesthetic, hiding the clutter in the kitchen from view. 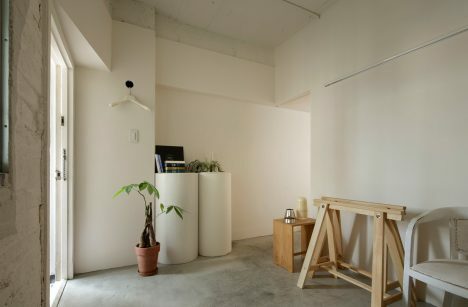 Minorpoet founder Hiroaki Matsuyama said that the apartment was designed “on the axis of tradition in Japan”. “In Japan, there is a culture to find beauty in plain design,” he told Dezeen. The space has a long and narrow floor, organised around the living and dining space. 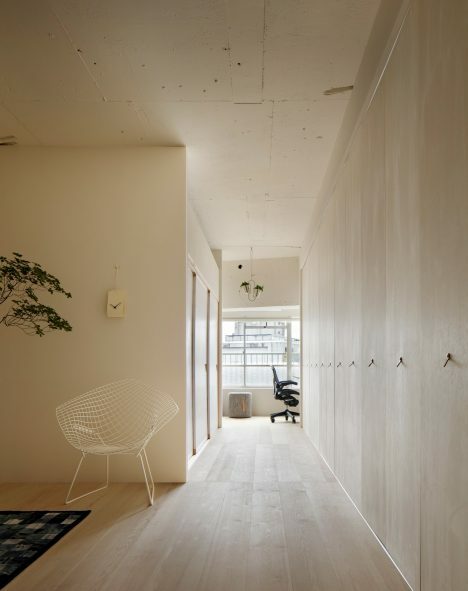 Matsuyama intended the layout to resemble a townhouse in Kyoto, with a traditional entrance, known as a doma, providing the client’s workspace. 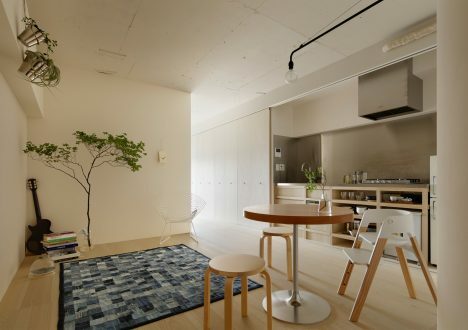 In a traditional Kyoto townhouse, the kitchen cannot be seen from the living room – so the same applies here. “The townhouse in Kyoto provides a doma at the entrance, and the space is called ‘mise’,” said Matsuyama, using the Japanese word for shop. A bedroom and bathroom are located at opposite ends of the living room. These are also accessed by sliding back wooden screens. Basic furnishings were chosen to fit in with the simple layout. The 60 stool by Finnish architect Alvar Aalto – a stackable seat in a minimal wooden finish – provides seating, while the Ulm Stool by Swiss architect Max Bill is used as a side table. Other details include a monochrome patchwork rug and an assortment of plant pots. Matsuyama founded Minorpoet in 2008. Previous designs include a minimalist apartment in Fukasawa and an exhibition space in Tokyo with swings for shelves and rolls of fabric for seats. Photography is by Satoshi Shigeta.